Arrow Academy boxset collects three recent gems from the Japanese master. Japan's Hirokazu Kore-eda has been writing and directing films for three decades now, but it's only in recent years that western audiences have come to appreciate his talents. Kore-eda has established himself as a modern master of intimate human dramas, earning favourable comparisons with Yasujiro Ozu. For this reviewer, he's arguably the most accomplished dramatist working in film over the last decade. 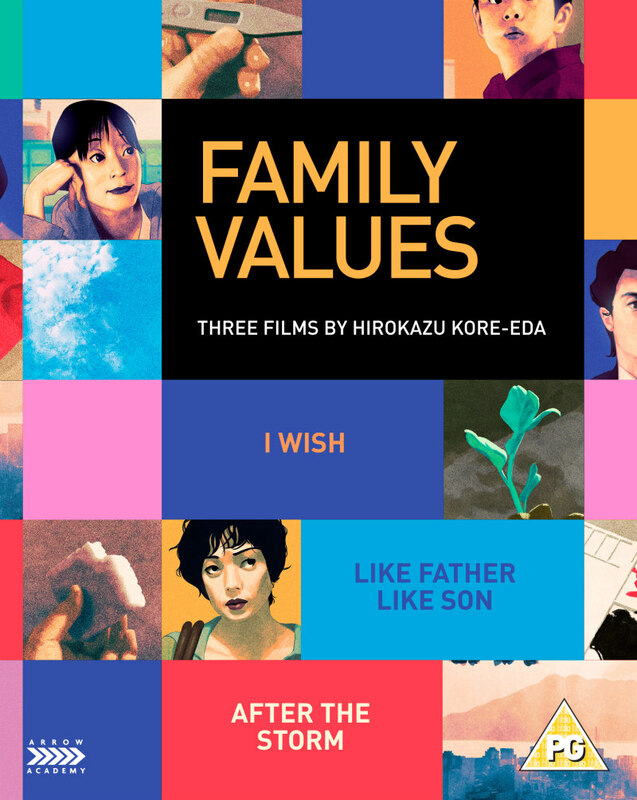 Arrow Academy's new boxset, 'Family Values', collects three of Kore-eda's recent dramas - 2011's I Wish, 2013's Like Father, Like Son and 2016's After the Storm, along with a host of special features. It's a shame it couldn't also include 2015's Our Little Sister, my personal favourite of Kore-eda's films, but that's a petty complain on my part. The movie that introduced most of his western fans to Kore-eda, I Wish tells the story of two pre-pubescent brothers, separated as a result of their parents' divorce. Kohichi (Kohki Maeda) lives with his mother (Nene Otsuka) in the home of his elderly grandparents' (Kirin Kiki and Isao Hashizume), while his younger brother Ryunosuke (Ohshiro Maeda) lives in another city with his rock star father (Joe Odagiri), the pair keeping in touch with frequent cellphone conversations. When Kohichi learns of an urban legend that claims anyone who observes two bullet trains pass each other will have their wish granted, he sets his mind on making an expedition to the nearest point where such an event is possible to witness. His wish is to have his parents reunite. Ryunosuke however has little desire for such a reunion, expressing no interest in returning to the foul atmosphere his unhappy parents created in each others' presence. The premise of making a wish is largely a macguffin, and it takes almost two hours to get to the point where the boys set off to observe the meeting of the high speed trains. Rather Kore-eda uses it as an entry point for a story of a family and the various friends and acquaintances that orbit its periphery. It's a film made up of vignettes that offer every character, no matter how minor a role they may play in the overall narrative, their chance to shine. And what an endearing and beautifully rendered bunch they are. Aside from the two young boys at its centre, there's a young schoolgirl who dreams of becoming an actress like her mother, the latter's cynicism proving no deterrent to her ambition; a kid adorably attached to his aging dog; the grandfather who toils over making the perfect sponge cake; the grandmother who frowns at the obsessions of the former, but loves her extended family nonetheless; the pretty teacher the young boys fawn over, one of them stealing her bicycle bell just to return it to her and bask in her appreciation. For a western analogy, think of Charles Schultz' Peanuts animations. Like Charlie Brown and company, Kohichi, Ryunosuke and their pals are recognisably childlike, but their concerns and questions are shared by adults, and I Wish is a film that could be enjoyed by children without ever talking down to them. Despite such a comparison, Kore-eda's film is very Japanese. Unlike many western storytellers, who continually believe romance can only be found in the magical and other-worldly, Kore-eda knows that romance can be uncovered in the everyday, in the majesty of the tallest mountains and the grace of the smallest of gestures. There's never any question over whether the bullet trains will grant the children their various wishes - the journey they make, and the lessons they learn along the way, are what's important here. Ryota (Masaharu Fukuyama) is a successful businessman. His success has come at a cost however, leaving him little time to spend with his wife and six-year-old son. A determined individual for whom winning is all that counts, Ryota sees little of himself in his son, who struggles with his piano lessons and "accepts losing too easily," and assumes the child takes after his kindly mother Midori (Machiko Ono) until the couple is informed of a mix-up at the hospital where Midori gave birth. Ryota and Midori are introduced to Yudai (Lily Franky) and Yukari (Yoko Maki), the couple who have been raising their natural child. Both couples are faced with the decision of whether to maintain the status quo or exchange the children. As a child, I was constantly told that winning isn't everything, it's the taking part that counts. Today that seems like an outdated idea as our society becomes increasingly competitive. There's nothing wrong with wanting to be a winner, of course, but, for too many of us, winning is simply about beating the opposition rather than proving our own abilities. In Like Father, Like Son Kore-eda examines this mentality from a distinctly Japanese perspective. Ryota is the classic workaholic Japanese businessman, but he's lost sight of the point of his work. On a visit to a man-made environment, the design of which he was responsible for, he can't share the wonder of a worker who explains the process of a creature's development from larva to pupa; Ryota simply thinks 15 years is too long a time. He displays the same impatience with his (unnatural) son's piano playing, asking the child why he bothers with the instrument if he can't conquer it. Yudai, on the other hand, is someone for whom life is purely about taking part. He's content with his life as a modest hardware store owner, as it allows him time to spend with his family, and his motto is "never do today what you can put off till tomorrow." Ryota simply sees this man's life as pathetic, and determines to win his natural son back from him. The set-up seems custom made for a crass Hollywood remake. I dread to think what the likes of Judd Apatow and Adam Sandler would do with this scenario. Kore-eda plays it straight, but the best film-makers know that even the most serious of scenarios require a touch of levity. Like Father, Like Son may plumb the depths of melancholy, and is one of the most heartbreaking films of recent years, but it's also got a fantastic sense of humour. Whenever things seem to be taking a mournful turn, Kore-eda interjects a great moment of comedy to cheer us up, like a friendly poke in the ribs. Unless, like its protagonist Ryota, you're made of stone, this is a movie you can't help but fall for. Recently divorced, Ryota (Hiroshi Abe), the one-time author of an acclaimed novel, is struggling to make his child support payments thanks to an addiction to gambling, and an addiction to losing. Using the resources of his job at an unscrupulous Private Eye agency, he spies on his ex-wife Kyoko (Yoko Maki), and is overcome with jealousy when he discovers she has entered a new relationship with a successful businessman. Ryota's a trainwreck, the sort of schmuck only a mother could love. Luckily for him, she does. The mother in question, Yoshiko (Kirin Kiki, an actress who possesses my favourite face in today's cinema), sees too much of her hapless husband in her son, and she's torn between wanting the best for him and realising that he simply may not be cut out for fatherhood. It's a well worn trope in cinema for movies to manipulate us into rooting for a father when the question of child custody is raised, no matter how unsuited he appears to be for the task. Ex-wives are cruelly portrayed as cold and calculated, simply because they've eschewed goofing around in favour of providing for their child. After the Storm is a refreshingly welcome subversion of this tradition. Though he possesses a certain charm, with a twinkle to his rugged features, and he means the best, Ryota is an absolute mess, and the film makes this all too clear. His ideas of fatherhood seem based on a checklist - buy the kid shoes; play some baseball with him; take him for a burger too big to fit in his mouth - rather than any natural paternal instinct, and we fully understand why Kyoko appears eternally stressed in her ex's presence. It would take a cold heart to deny him access to his son, but only the most deluded of Men's Rights Activists could wish for him to reunite with his long-suffering former spouse. Kore-eda makes character dramas in which character takes precedence over drama. At times his protagonists can feel like wind up toys that have veered off course, and where other filmmakers might reign them in to benefit a neater plotline, Kore-eda is happy to let them ramble off. His films are all the better for it, and it's why the people that populate his work feel more human (flawed, but generally well-meaning) than those found anywhere else in modern cinema. At times they may be inconsistent - Yoshiko seems to flip flop on whether she wants to reunite Ryota and Kyoka or encourage her son to move on - but humans are, aren't we? Even the supporting characters that pop up intermittently here - Ryota's sister/money-lender; his pretty young assistant at the PI firm; Kyoka's well-groomed new lover - feel like they're carrying their own invisible weights, and if the movie decided to change course and follow any one of them, we get the sense Kore-eda could pull off a drama as equally engrossing as the central story he's ultimately opted for. After the Storm may not quite hit the peaks of the director's recent modern masterpieces, but even second tier Kore-eda is essential cinema, and any opportunity to witness Kirin Kiki's wonderfully wrinkled face break into a smile is worth seizing. Arrow Academy have packed this boxset with extras set to delight Kore-eda's fans. We get brand new interviews in which the director talks in depth about his work; introductions by critics to all three films; a video essay on Kore-eda's movies; a documentary on I Wish; a feature length 'making of' for After the Storm; a 60 page collector's booklet and more, making this an essential purchase for fans of one of the finest filmmakers working in modern cinema. 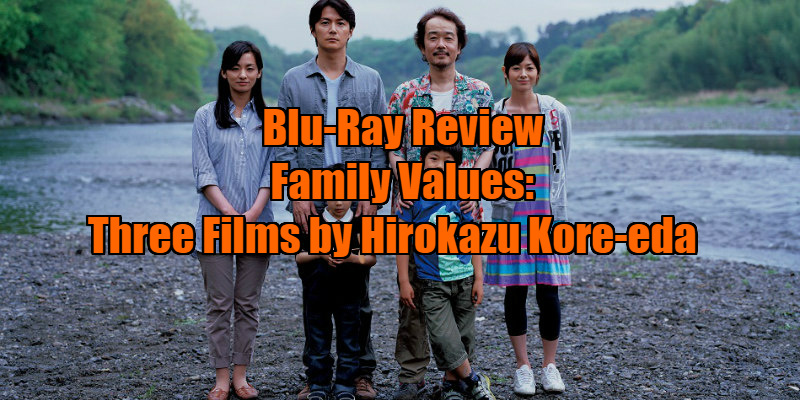 Family Values: Three Films By Hirokazu Kore-eda is on dual format blu-ray/DVD February 19th from Arrow Academy.